A major information security company has awarded the American Association of University Women (AAUW) $100,000 to expand course offerings in its National Tech Trek Program in which middle-school girls spend a week at a summer camp focusing on science, technology, engineering and math (STEM). The grant from Symantec will allow AAUW to create a pilot course in cybersecurity at camps scheduled at Bowling Green State University, Stanford University and the University of California Irvine. AAUW initiated the first Tech Trek summer camp at Stanford in 1998. Three years ago, the AAUW national organization expanded the program throughout the country and this summer 1,600 girls will attend camps in 21 locations, mostly on college campuses. 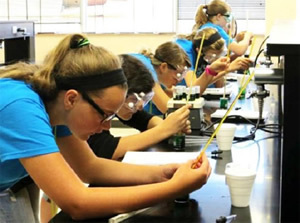 AAUW, an organization whose aim is to empower women and girls, focuses the Tech Trek camps on middle-school girls because it believes that is the crucial time to stimulate their interest in STEM topics. Research provided by AAUW indicates that 77 percent of Tech Trek alumnae have completed a precalculus course by the time they graduate from high school, compared to a national average of 37 percent for all girls. "Women make up just 26 percent of the computing workforce," said AAUW Executive Director and CEO Linda D. Hallman, "but AAUW is working hard to increase that number." "Providing STEM and literacy education to young adults, particularly women and minorities, is a business imperative at Symantec," said Vice President of Corporate Responsibility Cecily Joseph. "This grant will help build a pipeline of qualified girls to enter the in-demand field of cybersecurity."